There’s nothing more calming than the soft glow of candlelight. But safety often trumps ambiance, especially if children or pets are nearby or you need to leave a candle unattended. For those reasons, many of our candles remain unlit. The alternative -- flameless candles -- never seemed like a viable option. Most of them are just too fake looking. But we discovered the exception. The faux flames created by Candle Impressions are surprisingly convincing. The discrete battery-operated lights put out a glow that gently flickers like a true flame, and a blackened wick adds to the authenticity. 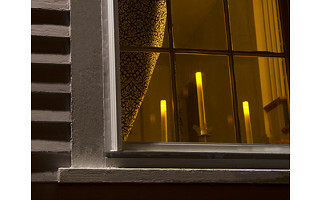 Plus, the pillars and tapers are made of real wax, so they look and feel like conventional candles. And you can’t beat the convenience. You can operate the candles wirelessly with a remote control, or you can use the timer, which programs the faux flames to turn on for five hours. With the timer function, you can set the lights to automatically come on each day at dusk, for example, and turn off before bedtime. No fuss, no messy wax. It’s the best of all worlds: Convenient, safe, easy ambiance that you can enjoy instead of worrying about. Hi folks! Angela here from Daily Grommet's Launch Team, and I'm glad to be given the floor to answer your questions. You can find me running Grommets to and fro around the office and thinking of new ways to connect founders and customers with a compelling story. I've worked closely with Candle Impressions, and would love to hear your thoughts or concerns about a product I've had my hands on for some time! Hi - how long do batteries last? Thank you. @Pamela Berard : Hi Pamela, each candle has a battery run-time of about 500 hours with standard AA batteries, and you can also find more information in the DETAILS tab . Thanks for asking! @Rosario We'll check on that for you. In the meantime I will take that vanilla set home and try it for a week and report back. I am sensitive to that kind of scent too so if it is prominent in a small space I will let you know. @Rosario: Currently, the remote control candles only exist in vanilla scent. Hope you'll consider the 4" unscented pillars or tapers. @Rosario I put the vanilla set in a small room in my house. The scent is as mild as it could be....but if you are super-sensitive to this you will not be happy. There is a tiny bit present, especially in the morning. For myself (very sensitive but not hyper) the low level of vanilla scent is liveable (but I would still prefer no scent). Hope that helps. Perhaps I missed it, but didn't notice what type of wax the candles are made out of. Beeswax, soy wax...? I would appreciate knowing, as some members of our family have life threatening allergies to some candles. @ Annie Mac Cuhal: These candles are made of traditional wax, not soy or bees wax. There’s nothing more calming than the soft glow of candlelight. 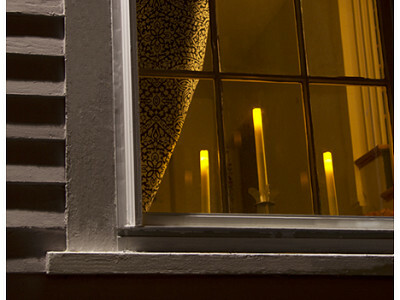 But safety often trumps ambiance, especially if children or pets are nearby or you need to leave a candle unattended. For those reasons, many of our candles remain unlit. The alternative -- flameless candles -- never seemed like a viable option. Most of them are just too fake looking. But we discovered the exception. The faux flames created by Candle Impressions are surprisingly convincing. The discrete battery-operated lights put out a glow that gently flickers like a true flame, and a blackened wick adds to the authenticity. Plus, the pillars and tapers are made of real wax, so they look and feel like conventional candles. And you can’t beat the convenience. You can operate the candles wirelessly with a remote control, or you can use the timer, which programs the faux flames to turn on for five hours. With the timer function, you can set the lights to automatically come on each day at dusk, for example, and turn off before bedtime. No fuss, no messy wax.